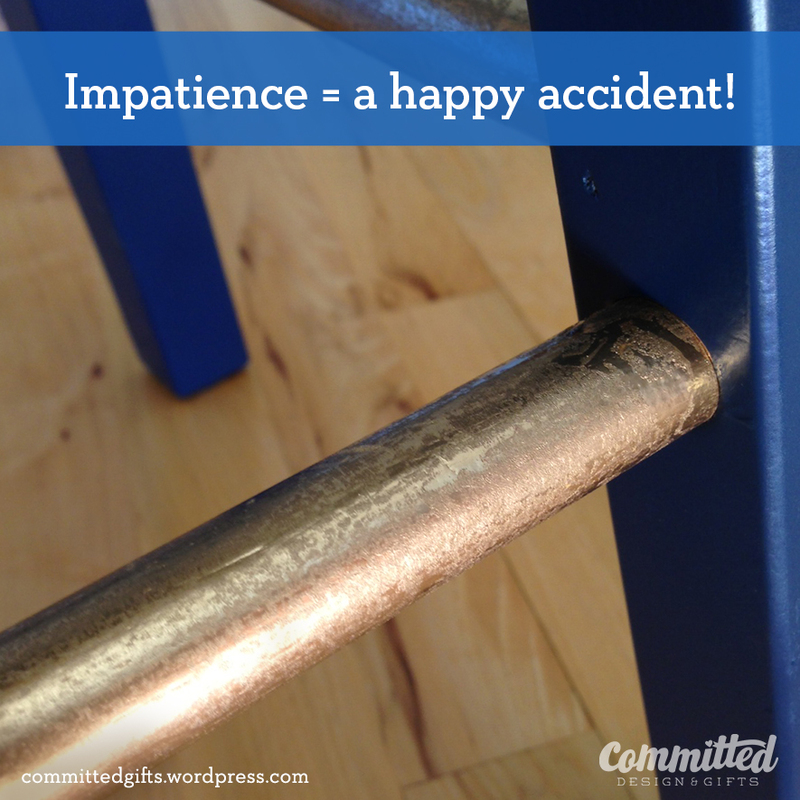 Thriftaholism: There is No Cure | Committed. This table was destined for our 2nd floor balcony, which means it won’t be pristine forever. But I wanted to give the tray a little polish. 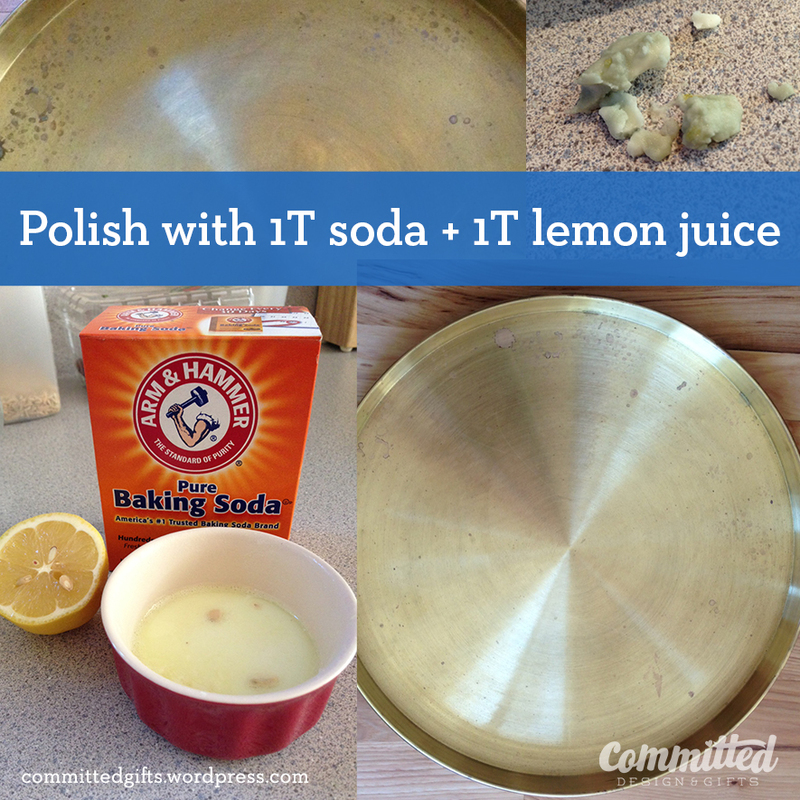 A little internet research, and I discovered that a damp towel, and a 1-to-1 paste of baking soda and lemon juice makes a good de-tarnisher. Just leave on for 5 minutes, then rub/polish off, rinse, dry, and voila! A little elbow grease and nontoxic natural polish goes a long way. As you can see, it’s not perfect, but much better. 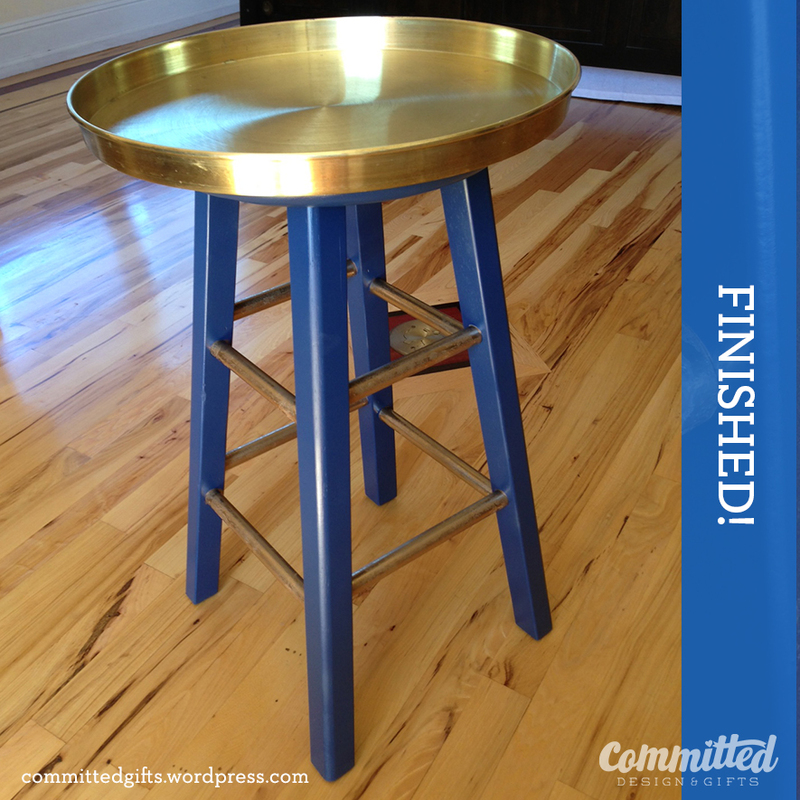 A standard stool makes the base. The stool was $4.99 at Goodwill. Paint and Super Glue: $11 (purchased at Lowe’s). Total for this project: $23. Weee! See why I get addicted to this stuff? I get almost smug about being able to do things myself and do them on the cheap. It’s obnoxious, but I’m not stopping it any time soon. So there. 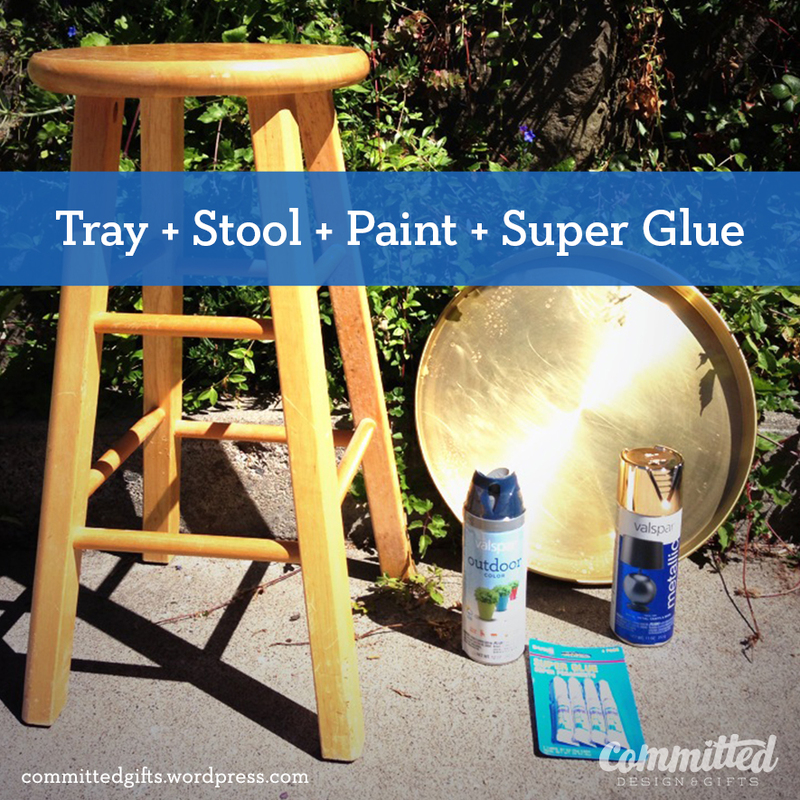 The stool needed a bit of sanding, even though the paints said I could skip that step. I wanted the gunk off, and a decently smooth finish in the end. 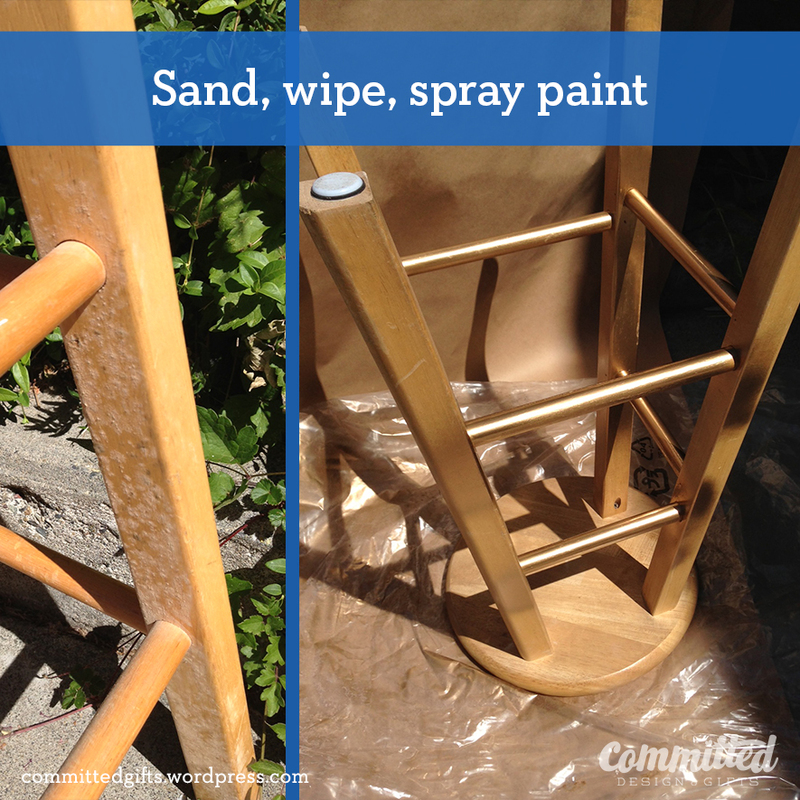 I spent about 5 minutes sanding with an 80-grit sanding sponge. Then I wiped it down with a damp rag and let dry in the sun for about 15 minutes before painting. I wanted the horizontal rungs to look metallic, so I sprayed those first with the gold. I did 2 light coats, which ended up being plenty. I was happy that it wasn’t super-light gold, as I wanted it to have more of the brass look to it. I should have let it dry for much longer, but it felt dry to the touch after 90 minutes, so I felt (foolishly) confident in gently applying painter’s tape to protect the gold from the next color. I didn’t want paint interfering with tray-to-stool adhesion, so painting it upside-down worked juuuust fine. 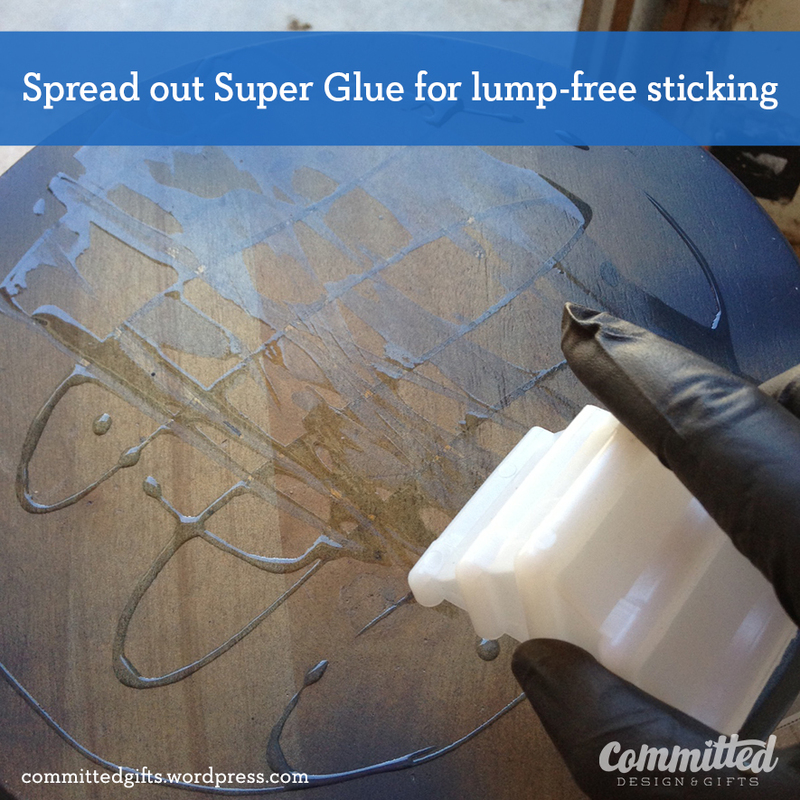 Once the paint was dry to the touch, I flipped it over and glued on the tray. Smoothing the Super Glue keeps the surface smooth. I found a piece of plastic in the trash to use as a ‘spreader’ for the glue. This may not have been a necessary step, BUT…I did a project once where I epoxied aluminum flashing to a table so it would have a cool metallic top. That project was a semi-disaster as the epoxy kept its shape and left lumps under the metal (even though I squeegeed, pressed, and did all I could). SO. I didn’t want this one to look like that. I also wasn’t interested in seeing screws in my lovely tray. It would have been the strongest and most secure bond, but since this table is more for light use, I was fine with glue. Anyway, I let the glue and paint dry for about 2 hours and then peeled off the tape. OOPS! 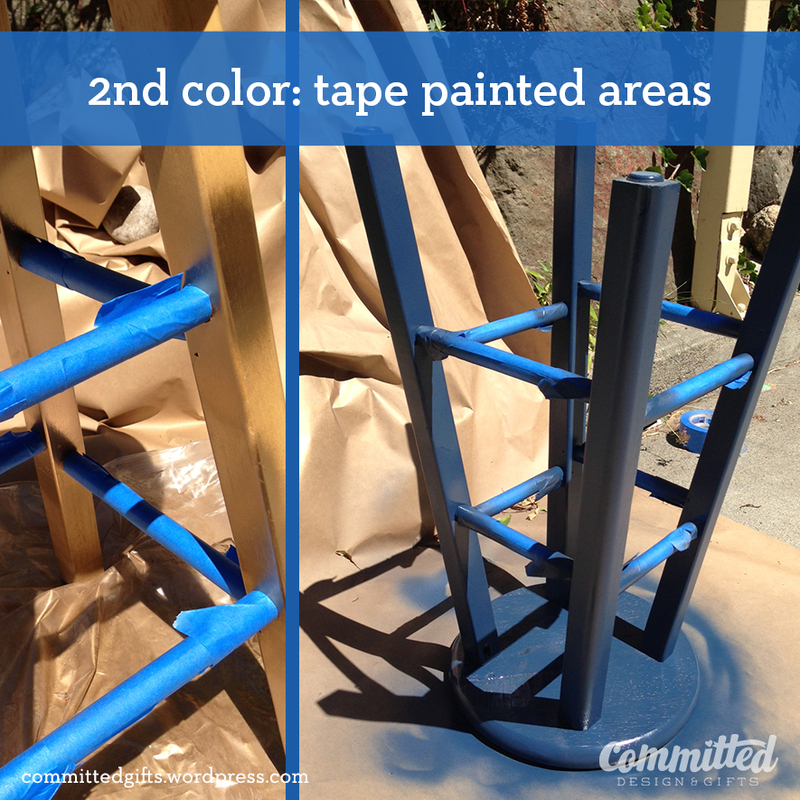 Painters tape on not-totally-cured spray paint looks like patina! Except, I was thrilled! Since the tray top will be exposed to the elements, it would look odd to have pristine rungs. And overall, it looks like real METAL rather than painted wood! So yay! Could I reproduce these results? Maybe. Probably not. Anyway, here she is! Isn’t she a beaut? So excited! I know we have dozens of more important projects to complete (ahem, window coverings…) but this one was SATISFYING. My husband was excited too–now we could celebrate the balcony and enjoy it like grownups. Luckily we have a few more months of gorgeous sunsets to toast! 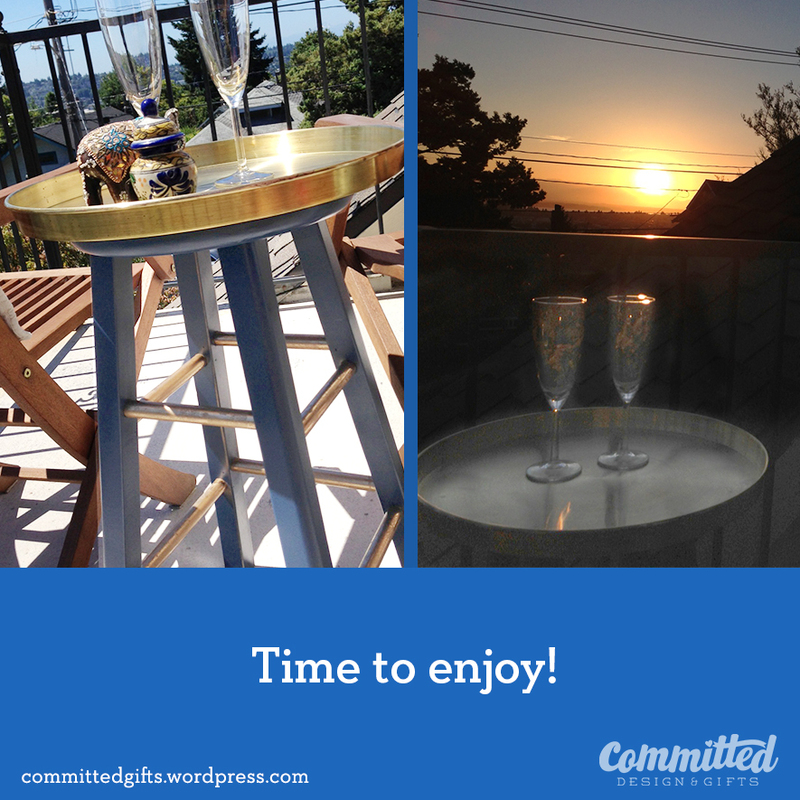 Sunset and bubbly on the balcony, brought to you by the new table. 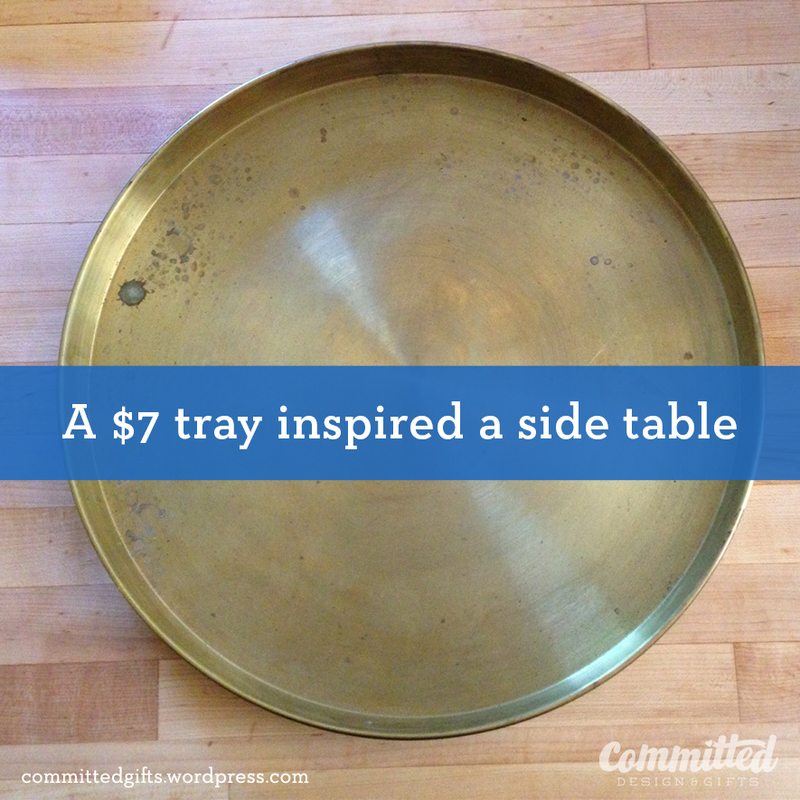 What DIY/thrifty projects have you completed recently? Feel free to post links to images/blog posts in the comments! That looks fantastic! Nicely done! Thanks! I’m enjoying your thrifty finds too! Excellent job! I too suffer from the disease….but never mind, I doubt they’ll ever find a cure. Thankfully, lol! It’s not really a problem until it’s getting in the way of other things in your life. Right? Right?!? Other things? There are other things? Lol! And thanks for the follow! Looks great and I love your happy accident! Thanks! It’s always nice when mistakes work out! SOOOOO GOOOOOOD! I too, am a bit obsessed with thrifting, and will likely never buy a new frame ever again after discovering the art of spray painting. I love this little table, and way to go on such an awesome find!! !